Ersilia Cauchi who married Leone Agius, They were parents of Jane Portelli friend of Leo Dougherty. Laurenzio Spiteri and Maria Vella were married on the 10 October 1815 in Nadur. Their son Giovanni Maria Anglu Anton Spiteri (In New Zealand known as James Spedderi) was born 1st October 1833 in Nadur Gozo and had a sister Giovanna Spiteri. and as a family story goes a brother Paul who came to New Zealand with James but found it too cold and returned to Malta. These are the only siblings we know of. Giovanna Spiteri married Michelangelo Cauchi 7th June 1862 in Ghajnsielem Gozo. They had a son Lorenzo. Lorenzo had 5 siblings none of them were ever married nor did they have any children only Lorenzo did. Lorenzo Cauchi was a Tailor, born in Gozo and Vittoria Lotti born Alexandria Egypt were married on the 13th May 1888 at Port Salvo Valletta Malta. Vittoria Lottis’ parents were Lodislao Lotti and Rosa Mifsud. (Lorenzo Cauci was a nephew of James Spedderi ). They had a daughter Ersilia Cauchi who married Leone Agius a carpenter on the 29th January 1921 at Porto Salvo Valletta Malta. His parents were Carmelo Agius and Giovanna Borg they were married on the 24th of November 1881 at Senglea. Leone died very young aged 52 of a heart attack. in Malta. Ersilia’s siblings were Ercole a brother who married Carmela Ciancio 24th January 1929 Port Salvo Valletta, Joseph, Carmena and Michael. Leone Agius’ Siblings were Lawrence, Josephine, Nazarunu and Carmen. When one looks at the marriage witnesses of Lorenzo Cauchi and Vittoria Lotti it shows they probably had no family or friends in Malta at the time because one was a Domenican priest Fr.Giuseppe Galanti who was born in Sicily, and the other was a church helper Carmelo Camenzuli. Ersilia and Leone Agius were the parents of Jane, (married Anthony Portelli Egyptian, born in England) Rose, Joseph, Carmen & Michael. 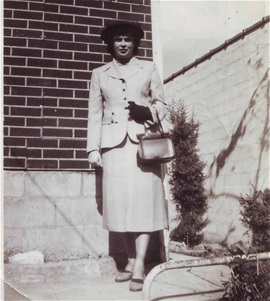 Jane who married Anthony Portelli and had Margaret and Leo (Lenny). Jane was married in Malta and emigrated to Windsor Canada with 2 of her sisters and 1 brother the eldest brother settling in New York. Anthony (Tony) having a visa and working in Detroit. The family eventually moved there. Jane hated the big noisy dirty city. Of course they shifted to Florida where she died. Her husband Tony Portelli died in 2014 in his early 90's. Jane says in one of her letters to Leo Dougherty ‘that if it happens one day we win the Irish sweepstakes we will be happy to visit you and whole family which is quite a family God bless them‘. Strada San Marco 45 Valletta Malta. 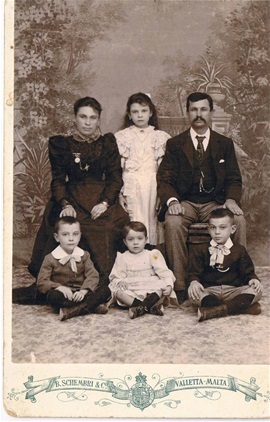 Vittoria and Lorenzo Cauchi with their children. On the back of this photograph is a name and address. L. Cauchi, Strada San Marco 45 Valletta. Mark Carauana migration Officer found this for me. The house 45 Sda San Marco is still there, but it seems that the former house has been now built into small flats, one of which is a bakery. Triq San Mark is Maltese for Sda San Marco or St Mark Street Valletta. There are phone subscribers today living there I also found Lorenzo listed in the 1900 Voters Roll. Now to vote in 1900 and 1920 you need to be either literate (able to read and write) or a person with property or income (such as rent) or a professional or middle-class person. Other persons and women were not eligible to vote then. Lorenzo was the son of Giovanna Spiteri and Michaelangelo Cauchi. He was the nephew of Giavanni Maria (James Spedderi). This wonderful photograph is of Lorenzo Cauchie (son of Giovanna Spiteri nephew of Giovanni Maria (Gamri) known in New Zealand as James Spedderi.) his wife Victoria and Family. Leo Dougherty carried this photograph with another in his wallet for years. Written on the back is Janie saying "Its me" and Leo has written Jane Portelli Detroit. Toronto. August 12 1924 - 0ct. 9, 2004. Palm Coast - Jane C. Portelli, 80, of Brushwood Lane, a master seamstress in Birmingham Mich., before her retirement, died Saturday at Florida Hospital-Flagker. Born in Malta, Mrs Portelli moved here in 1984 from Sterling Heights, Michigan. 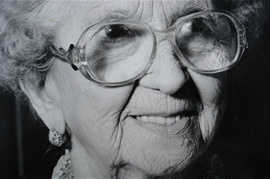 She was a member of St. Elizabeth Ann Seton Catholic Church and enjoyed quilting. Survivors include her husband of 62 years, Anthony, a son Leon, Winter Park: a daughter Marge Frassrand, Palm Coast: two brothers Joseph Agins, Hickville. N.Y. and Michael Agins. Port St. Lucie; six grandchildren: and two great grandchildren. 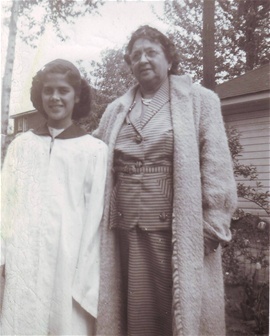 Last residence 32135 Palm Coast, Flagler, Florida U.S.A.
Janes Daughter Margaret Portelli having first communion taken with Janes Mother Ersilia Agius. Hello, I guess whoever is reading this letter is anxious to know from where it coming. Well I dont really know how to start myself but I have just found out that we are related to each other so I said to myself its nice to write and get aquainted by letter although we are too far away one almost south of the globe and we are up North of the World. Well my family and I came from Malta I've been living in Canada since 1949. 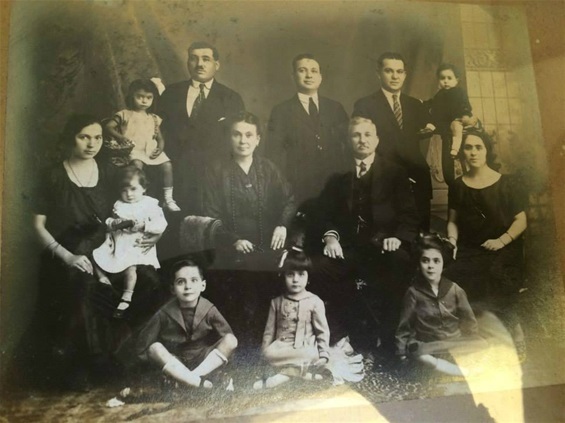 I am the daughter of Elsie Cauchi her Father which of course is my Grandfather. he came from Gozo and married an Egyptian girl her name is Victoria. his Mother name is Giovanne Spiteri which happens to be old Jimmy's sister we used to call him Uncle Jamri. As I can understand you whoever you are is a son or daughter of the late Jim or maybe Grandson or Granddaughter which I really would like to know. I had my Grandfathers brother Paul who came to New Zealand 48 years ago and lived with somebody in your family. Well about me, my name is Jane married to an Egyptian boy who is British by birth we got a girl almost 10 years old. My mother is here she remember your Grandfather Jimmy when he came to visit them although she was a little girl.